Love and Ruin by Paula McLain. From the point of view of Martha Gellhorn, famed novelist, travel writer, and journalist during her marriage to Ernest Hemingway. I really like Mclain’s first novel The Paris Wife from point of view of Hadley Richardson, Hemingway’s first wife, so I’m all in for this one. Amazon doesn’t have the paperback/hardcover deal by the e-book is $3.99 at the time I posted this. That concludes my list but there are so many more books I want to read that are currently on sale. What do you think of my list? Is there any you would or would not recommend. Would you like to see more post like this one? This blog won’t be book reviews forever. I do plan on getting back to discussing some writing struggles but for now, this is what I got. Should I buy the hardcover additions of The Daughter of Smoke and Bone Series? The debate still lives in my mind. And an update on the box set available in October is a price decrease from $57 to $51. Barnes & Noble has even a better deal. The box set is only $37. Thanks B&N for making my decision a lot easier. In this post, to help my brain, I will review the second book in the series Days of Blood and Starlight by Laini Talyor. If you haven’t read the first, warning, just the synopsis may give away some spoilers. Read ahead at your own risk. Karou has finally learned about her past. She know knows where she comes from and who she is. Karou’s stories continues but she sets out without her family or friends. Karou must work for The White Wolf the same wolf that ended her last life. She uses the skill she learned from Brimstone to make monsters to fight in the Wolf’s army. Her once-beloved, Akiva, tries to undo some of the wrong of his past and ties to save as many as he can. I still love the wonderful unique prose. The first half of the book was slow and made it hard to get into until it wasn’t. The world building is clear and vivid. The character descriptions of half human/ half beast is imaginative. Still the same engaging characters and a few new interesting introductions. Taylor has gift by making the reader feel the defeat of her character’s and their situation but as the story plays out the reader can feel the main characters, Karou and Akiva, grow from followers to leaders. Love how this young adult novel has found a grown-up voice with the cold truth of the ugly side of war. This story is not all daggers and pain. Taylor still manages to add some humor, romance, and hope. What I loved about this story is that this is not just about star crossed lovers but the depth to save a people, save two worlds, and save themselves. I’m trying to keep the spending down. For me this isn’t hard when it comes to things like cloths or extracurricular activities but books, they are my spending weakness. I’ve been doing well lately. I have mostly borrowed from the library and friends. There hasn’t been too many books I’ve come across I feel I need to own. I’ve been pretty happy reading them and giving them back. I’m very proud when I’m able to put down the books I find in book stores and simply check it out of the library. It has saved space on my bookshelves already overflowing with read and to-read copies of dozens of books. I now have a set of books I feel I need to own and in hardcover no less. 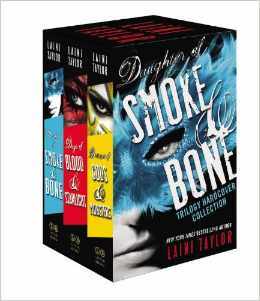 The book series is The Daughter of Smoke and Bone by Laini Taylor. I love the story, the characters, the settings, and the cover art. I’ve tried to win them in Goodreads giveaways but I’ve had no luck. The good news, the hardcover is still available for the first book in the series. Since this thought has been on my mind since the release of the third novel in the series I decided to look up the damage this purchase would cost my wallet and the outlook is not good. I understand what I wanted but it still hurts when you see the $56 dollar price tag. But that total was all the individual books added to the cart. Next, I looked up to see if they have a box set. It looks like the box set is not out yet and not planned to be released until late October but with a $52 tag. I think I will wait and keep an eye on the price of the box set to see if it decreases before October. Maybe by October my wallet will be a bit better, the set will be somewhat cheaper and I can justify a great series on my bookshelf. If you haven’t read The Daughter of Smoke and Bone series my short review is below of why I think it’s worth the read. I came across this book because of Vaginal Fantasy, a book club introducing me to romance genre books with strong female leads in the urban fantasy, sci-fi, and historical fiction. The first book is called The Daughter of Smoke and Bone and as I said above it is by Laini Taylor. This story is about Karou, a blue haired, tattooed, knows multiple of languages, art student, and orphan living in Prague. To her sassy, sarcastic, lovable best friend, Zusana, Karou is a girl who draws amazing monsters in a sketch book. What Zusana doesn’t know is Karou’s demons are real and the only family she has known. Karou is just trying to get over her crummy ex-boyfriend and do her job, collect teeth for her beast like foster father Brimstone. As Black Hand prints start showing up on Brimstone’s portal doors in cities around the world what comes to past is a history with no good or evil but a muddled gray of sides. This book is labeled young adult but I believe it can appeal to an adult audience. The author has an impeccable writing style. The world building and setting is clear, imaginative, and beautiful. The characters are unique. I liked Karou, Brimstone, and the shop full of teeth. You know that Karou’s job to collect teeth is serious business when it is on the black market in exchange for wishes. Taylor doesn’t disappoint when the reader learns what the teeth are being used for. The romance that develops in the second half of the narrative slows down the book a bit but the mystery of the characters and their pass is what kept me reading. When the story ended I was left with more questions and looking forward to the sequel. I want to thank Felicia Day, Veronica Belmont, Kiala Kazebee and Bonnie Burton (the girls from Vaginal Fantasy) for opening my mind to wonderful books I would have missed out on like this one. 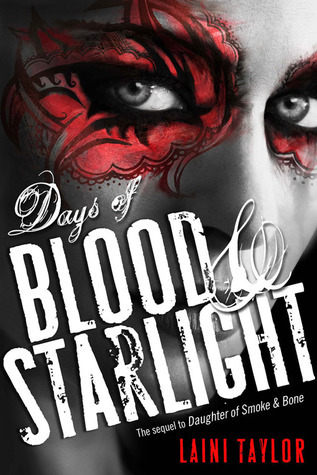 I’ll write a review for the second book in the series, Day of Blood & Starlight next week. Maybe this will help me make some bookshelf decisions by then.